Rick Montoya, the protagonist of the Rick Montoya Italian Mystery Series, is a cowboy boot-wearing, hyphenated Italian from New Mexico in the United States. His mother was from Rome, Italy, and she made sure her son grew up fluent in her native tongue. University degrees helped Rick's language skills further, and set him up well for his career as a translator and interpreter in Italy, which is possible because he holds dual citizenship. The recurring cast of the series includes a friend with the Italian art police, and an uncle who is a police Commissario, providing Rick, the amateur detective, with that necessary insider information to help the hero catch the bad guys by the end of the book. I've only read book three in the series, Murder Most Unfortunate, which is set in Northern Italy's Bassano del Grappa on the Brenta River, in the Veneto region. The murder mystery begins with the murder and we know the motive, making it structured like a police procedural, but we follow an amateur detective, not the police on their search for the killer. Cozy mysteries establish the setting and possible suspects and victims long before the murder takes place, then set the amateur detective loose, but we get those suspects and learn about the victim after the murder in Murder Most Unfortunate. So I'd have to put this book/series as a cross between the two genres, with elements of the traditional male protagonist adventure story, like the hot female character who falls for our tough-smart hero and joins him on his adventure, and some action sequences. Rick, or Riccardo as he is often called by Italians, has an eye for the ladies, and his handsome looks and cowboy boot, New Mexican uniqueness draws the ladies to him. The author includes descriptions of the Italian setting, but spends a bit more time describing the local food specialties, which should please the vicarious gourmand readers. There are also some Italian words sprinkled through the story to add flavor. The dialog is a bit stilted, but that could be because it is used to move the story forward, presenting much of the information through interviews with the suspects. Part of the male adventure story aspect of the story is a hot, green-eyed waif in tight clothes who falls for Rick Montoya and helps him with his investigation. I thought the author shouldn't have called the thirty-year-old woman a "girl" or even a "young woman". Rick and his hot waif get to enjoy some action scenes with racing cars and motorcycles. The author keeps the story clean, however, and there is only a small bit of in scene violence. All in all the book was a light, entertaining read, but probably more suited to a male reader. Don't expect literature or psychological drama or deep conspiracies. This is a light mystery novel set in Italy, with a hunky male protagonist, some local color, and much local food. Here are all the books in the Rick Montoya Italian Mystery Series to date, with their official book descriptions. Rick Montoya has just moved from Santa Fe to Rome, embracing the life of a translator. He’s beginning to embrace la dolce vita when school friend Beppo, now senior in the Italian Art Squad, recruits Rick for an unofficial undercover role. Armed with a list of galleries, suspects, and an expense account, Rick would arrive in Tuscany posing as a buyer for a Santa Fe gallery and flush out traffickers in priceless burial urns. But, before sunset on his first day in Volterra, the challenge intensifies. Rick has one quick conversation with a gallery employee who dies minutes later in a brutal fall from a high cliff. Has the trade in fraudulent artifacts upgraded to murder? Are the traffickers already on to Rick? The local Commissario and his team consider Rick an amateur, and worse, a foreigner. Plus Rick is a suspect in what proves to be the dead man’s murder. While the Volterra squad pursues its leads, Rick and the Volterra museum director continue to interview his list: a top gallery owner, a low-profile import/export businessman and his enterprising color-coordinated assistant, a sensuous heiress with a private art specialty and clientele. When Rick’s lover Erica, an art history professor, arrives from Rome to visit him, she rekindles a friendship with an alluring, maybe dangerous, heiress. Has Rick’s role made him the target of both cops and criminals? Rick Montoya is looking forward to a break from his translation business in Rome—a week of skiing in the Italian Alps with old college buddy Flavio. 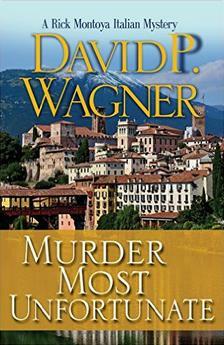 But Rick’s success helping the Italian police with a murder in Tuscany sends the Campiglio cops his way. An American banker working in Milano is missing. The man’s sister, an attractive and spoiled divorcée, has no idea where he could be, nor do the locals who saw him on his way to the slopes. With the discovery of a body, Rick and Inspector Albani widen their list of suspects. Picturesque resort Campiglio harbors old rivalries, citizens on the make, and a cut-throat political campaign. Why would these local issues, any of them, connect to the missing banker? The investigation doesn't keep Rick and Flavio from enjoying perfect ski conditions in the Dolomites and glorious after-ski wines and bowls of fresh pasta. As for women—Rick has to wonder if the banker’s sister is just hitting him up for information. 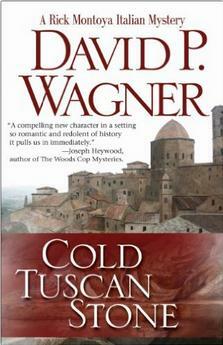 The action heats up, testing laid-back Rick whose uncle, a Roman cop, keeps urging him to make the police his career. As in Cold Tuscan Stone, Death in the Dolomites immerses us in the sights, smells and tastes of Italy, this time in a picture-perfect Alpine town with a surprising negative side. 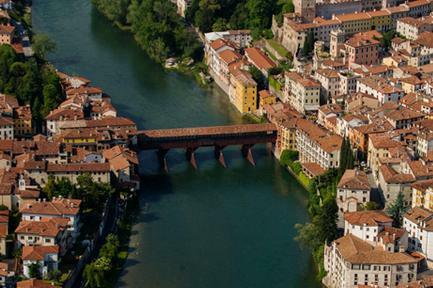 Winding up an interpreter job in Bassano del Grappa at a conference on artist Jacopo da Bassano, a famous native son, Rick Montoya looks forward to exploring the town. And it would be fun to look into the history of two long-missing paintings by the master, a topic that caused the only dust-up among the normally staid group of international scholars attending the seminar. 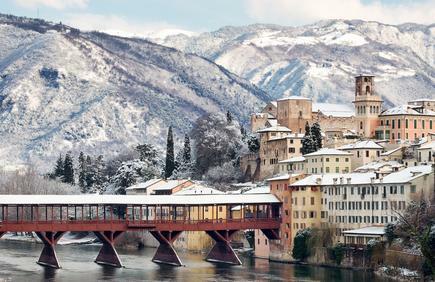 Bassano has much to offer to Rick the tourist, starting with its famous covered bridge, an ancient castle, and several picturesque walled towns within striking distance. He also plans to savor a local cuisine that combines the best of Venice with dishes from the Po Valley and the surrounding mountains. 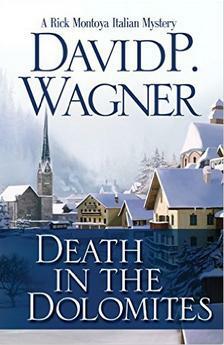 These plans come to a sudden halt when one of the seminar's professors turns up dead. Rick is once again drawn into a murder investigation, this time with a pair of local cops who personify the best and the worst of the Italian police force. At the same time he's willingly pulled into a relationship with Betta Innocenti, the daughter of a local gallery owner, who is equally intrigued by the lost paintings. They quickly realize that the very people who might know the story are also the main suspects in the murder—and that someone not above resorting to violence is watching their every move. Please visit the author's website where he blogs and provides information on the locations in the books and their regional dishes. Visit the Poison Pen Press page for the Rick Montoya series.